On July 4th, a new American embassy opened in Berlin, Germany. Naturally, the opening was accompanied by American craft beer. A reception was held on Pariser Platz square and attended by over 4,500 guests, including former President George H. W. Bush, current German Chancellor Angela Merkel and a host of ministers from the German government. 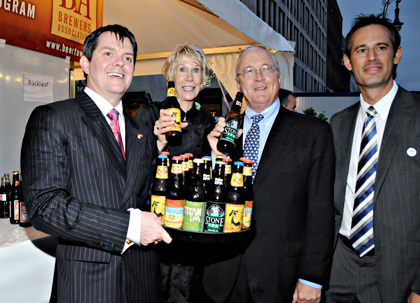 Bobby Richey, Sue Timken, Ambassador Timken, and Sam Bessinger show off American Craft Beer at the American Embassy in Berlin, Germany. “We wanted to celebrate the return of the U.S. Embassy to its historic home in downtown Berlin in a very American way,” commented Bobby Richey, Jr., Counselor for Agricultural Affairs for the U.S. Embassy in Berlin. “We chose to serve U.S. craft beers because they embody many of the attributes typical of U.S. agricultural products: quality and innovation.” Richey contacted the Brewers Association’s Export Development Program, who provided 47 different craft beer brands from 13 American craft breweries from member breweries at the reception. I sure like to know what beers they all had and if anyone had any comments. Of course being politicians I’m sure it was all good.